Gaetano Antoniazzi, pupil of Enrico and Giuseppe Ceruti, brought the Cremonese tradition of his teachers to Milan in 1870. Gaetano Antoniazzi, along with his sons Riccardo and Romeo, trained Leandro Bisiach, and together with the Antoniazzis, Bisiach influenced the creation of a workshop environment that was to dominate early 20th Century Italian violinmaking. Departing from the historical Italian tradition of small artisan shops, Bisiach copied the Vuillaume model of a much larger workshop, in which many workers were engaged in the various activities of making and repairing string instruments, all under the umbrella of the violinmaking owner. While very early Italian shops such as those of Amati and Stradivari had engaged in a similar type of production, the scale of that production and the number of workers involved in it was far lower. The result of this highly successful business model was that Milan became a hotbed of skilled violin makers. It was under this system that many important 20th Century Italian violin makers received their early training, among them Ferdinando Garimberti, Giuseppe Pedrazzini, Giuseppe Ornati, and Gaetano Sgarabotto, to name but a few. In 1911, a 20-year-old American, the aspiring instrument maker Alfred Lanini (or Alfredo, as he called himself in Italy) traveled from San Jose, California to Milan to work with Riccardo Antoniazzi. Although Antoniazzi died only six months later, Lanini continued working there under the guidance of Celeste Farotti until 1914, when he returned to the United States. Resettling in California, Lanini continued to make instruments that displayed the strong imprint of his initial Milanese training. In 1928, Lanini moved to Paris to study bow making under Husson. He made about 100 bows before an allergy to pernambuco dust forced him to discontinue his bow making. Nevertheless, he did keep the European traditions he had learned alive: he taught Californian John Bolander bow making, and taught violin making to his two sons, Paul and Henry. When Alfred died in 1956, his son Henry took over the shop and continued the work until he passed away in 2003. There are very few extant examples of Alfred’s work from his time in Italy. It is easy to imagine that as an apprentice, Lanini was likely assisting others, and therefore did not have much time to work on his own instruments. However, the two pictured here show the high level of achievement that he attained as a maker while in Italy. They are also very interesting from a historical standpoint, in that they show an indelible connection to early 20th Century Milanese violin making and more specifically to Riccardo Antoniazzi. Upon returning to the United States his work is still interesting but shows a heavier, less-refined style. 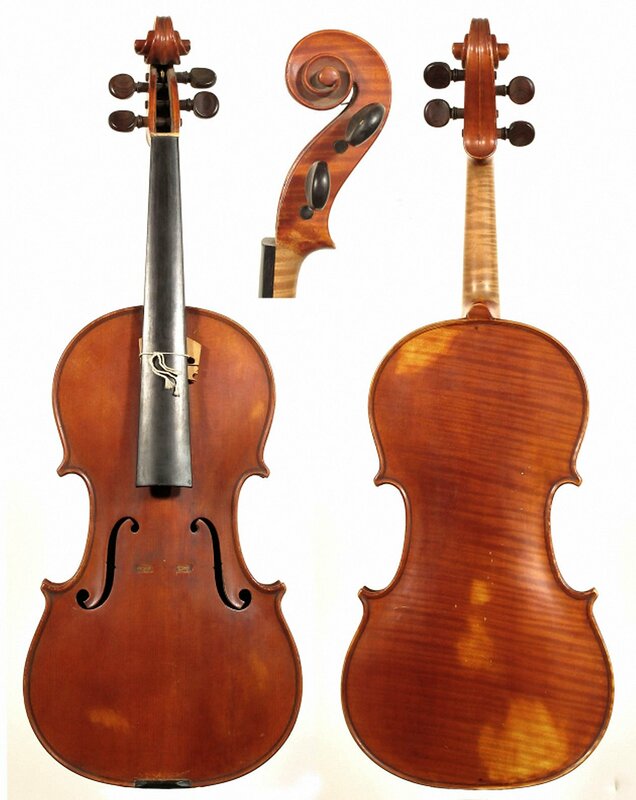 In addition to this violin (made in 1915) there is a quartet made in the same year and in the same style, that was awarded a silver medal in a competition to mark the opening of the Panama Canal. During the 1920s Lanini’s work as an instrument maker seems to have been put on hold; almost no instruments exist from this period. The reasons for this are not known, but Lanini did have young children during this time, so it is plausible that he was busy being a father and running a violin shop, leaving him little or no time to be a maker. A few child-sized violins survive from this period; possibly these were gifts for his own children. In the 1930s Alfred Lanini was back at the bench in earnest, and he produced a number of fine instruments. Aside from the few examples made in Italy this was Lanini’s best and most prolific working period. 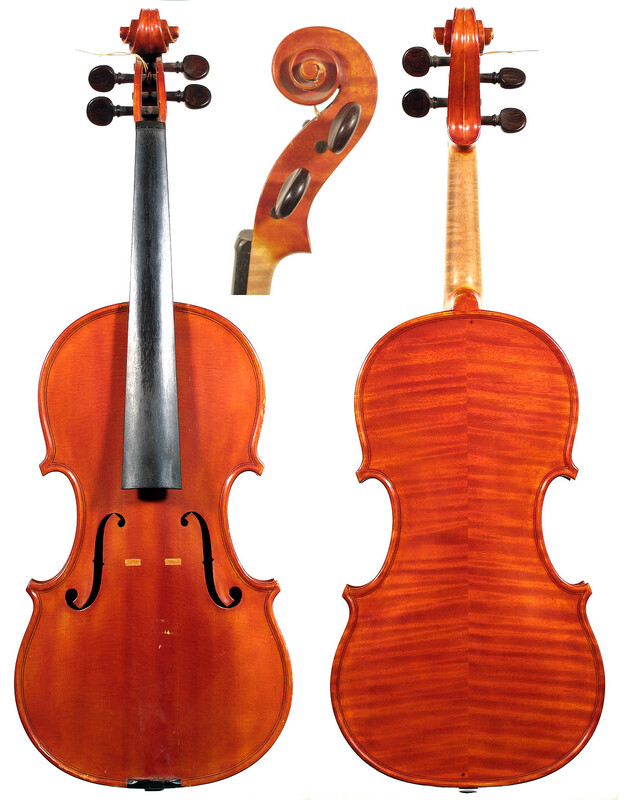 The instruments from the 1930s demonstrate his admirable artistic capabilities; these instruments bear testimony to a high level of technical skill, and to a conception of violin making rooted in the venerable tradition of Alfred Lanini’s training. The examples pictured here were made in 1936 and 1937 respectively, and stylistically they clearly follow the Antoniazzi school. Though Alfred Lanini remained prolific through 1940s and 50s, until his death in 1956, instruments from this period show a decline in the standard and individuality of his work.